Announcement #30: Lucifericon (nl) to play KDF VII!!! Tonight we have the pleasure of presenting a Dutch band that has been on our radar for years. Their epic debut full-length that came out last year ended up among our favorite releases of last year. 2019 marks the 10th anniversary of this great death metal band who features some old faces of the Dutch death metal scene. 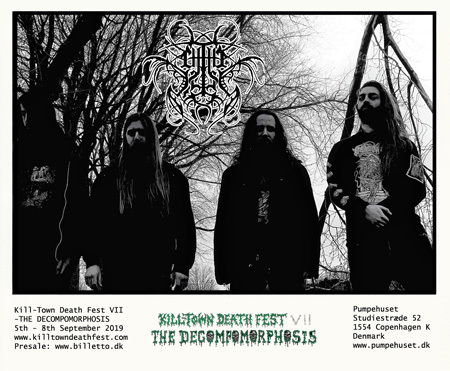 We are therefor excited to announce that LUCIFERICON will play KTDF VII!!! Lucifericon are a study in patience and poise. Founded in 2009, it wasn’t until 2012 when the band’s first public recording, “The Occult Waters” EP, reared its shadowy head. Although “The Occult Waters” was the band’s debut, the seemingly “new” Lucifericon was actually comprised of a number of metal scene veterans, its members having done time as Destroyer 666, Pentacle, Malicious Dream, and Excision among others. Naturally, at this stage, the quartet deeply understood the Metal of Death and proceeded to offer a unique, more atmospheric twist on it. Four years later followed another EP, “Brimstone Altar”, to further critical acclaim. Here, Lucifericon’s death metal was blackened to a crisp, its robust recording allowing every evil nuance to spill from the soundfield and further bewitch the eardrums. With that envious foundation judiciously set, at last arrives Lucifericon’s first full-length recording, “Al-Khem-Me”. Tongue-twistingly titled but aptly so, “Al-Khem-Me” keeps apace with the developments of “Brimstone Altar” and further masters the art of the “patient payoff.” Its blackened DEATH literally explodes from the very first seconds, but the band’s songwriting builds detail upon subtle detail despite the obvious aggression employed. Utterly gnarled and gnarling, the lurch ‘n’ lunge across “Al-Khem-Me” creates a bewilderingly slipstreaming effect, dragging the listener into a distant, nameless vortex, but always with a keen knack for memorability. For above all, this is METAL, unbending and unyielding, forged in fire and wielded as a weapon; it just so happens that Lucifericon’s is one fully set on attack, its intensity steeped in the grand traditions of late ’80s / early ’90s death. Al-Khem-Me heralds the grand arrival of Lucifericon! Announcement #28: Israel’s HAR to play Byhaven stage!!! Today we will turn our focus back to the Middle-East and once again dig up a rotten corpse of the Tel-Avivian underground metal scene. Though initially dubbed as a black metal band, the band we are about to announce has over time and especially with its 2018 EP released through Blood Harvest Records, moved more into the realms of obscure, dark and chaotic death metal. We are therefor excited to announce that Israel´s HAR, will be performing our ByHaven stage during KTDF!!! Hailing from Tel-Aviv, Israel, Har was formed in 2014 as a 4-piece band by members aligned with bands such as Tamut Amen, Kever, Venomous Skeleton and Mortuus Umbra. Initially the intention was playing a form of raw black metal, a period which is summed up in their debut EP “BAAL HA-OV” which was release by Wolfsbane Records and Orgasmatron Records. Yet as time went on and with the addition of a second guitar player, the urge to express chaos and to delve into obscurity took the band in a path which resulted in “VISITATION”, the band’s second EP, released via Blood Harvest Records in early 2018. Following the release and a line-up change, replacing S.Pollak on guitar With T.Cohen (Mortuus Umbra, Kever), the band embarked in September 2018 on its first appearance outside Israel with a mini-tour through Germany and the Netherlands. The band is currently working on new songs for their next recording which will be a continuation and intensification of the path already taken towards frantic expressions of exalting chaos and obscurantism. Today we will once again turn our focus back on the greatest death metal nation of Scandinavia; Finland. Despite being around since 2011, it wasn’t until last year’s release through 20 Buck Spin, that the band we are about to announce caught our attention. With an amazingly twisted psychedelic approach to death metal this release really hits a nerve and was definitely on our top 10 list of releases from last year. Therefor we are excited to present to you, the spaced out heavy sounds of GHASTLY!!! 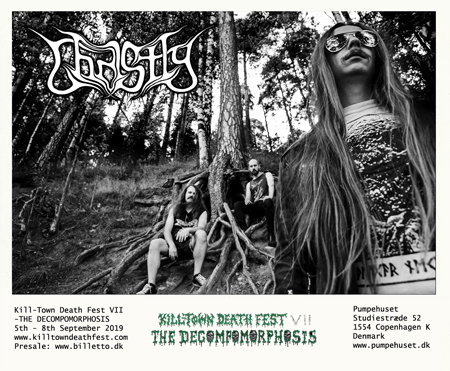 Ghastly is a Finnish hallucinogenic death metal band from Tampere. They started out as a duo, but slowly been raising it’s ugly presence on stages as a full band. 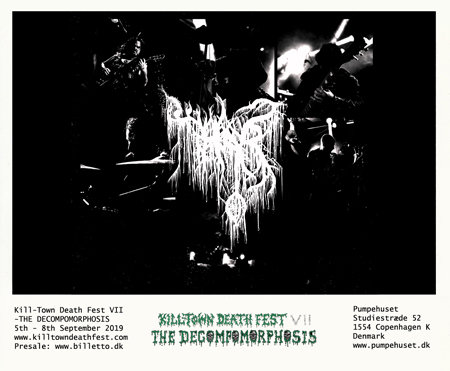 The self-released demo tape “Death is Present” came out straight after the forming of the band in late 2011. Same approach continued on the next offering, a 7” titled “Serpentine Union / The Divine Fire” (Demonhood Productions, NO, 2013), but on the debut full length, “Carrion of Time” (Me Saco Un Ojo Records, UK, 2015) the band had more psychedelic vibes and hooks to offer. After a few years of calmness, the time was right to unleash another psychedelia infused & otherworldly full length album that goes by the name “Death Velour” (20 Buck Spin, USA, 2018). A five year live hiatus were broken in September 2018, to support the mighty Anatomia, among others. Blending the early 90’s Finnish death metal into an eerie world of horror movies, accompanied with psychedelic sound and chaos. That’s what Ghastly is all about. 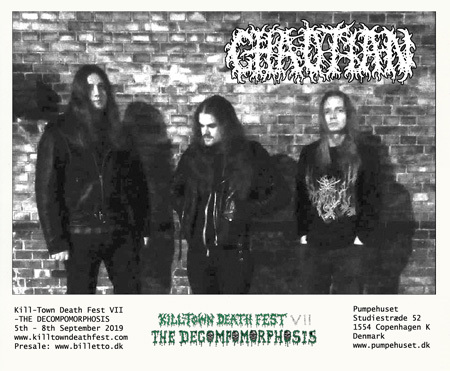 Announcement #26: Chaotian (dk) to play Byhaven stage during KTDF!!! 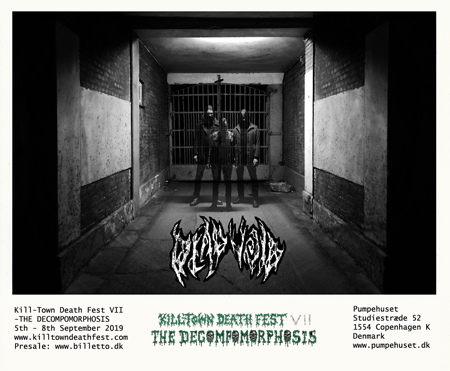 Today we have the pleasure of presenting one of the newest additions to the Killtown family of Copenhagen-based death metal bands. With only one demo to their name, they quickly gained attention from outside Denmark being added to the Extremely Rotten Production roster. 2019 will see them release more new material through both ERP and Me Saco Un Ojo. Therefor its with great pleasure that we can announce that CHAOTIAN will perform their first festival appearance on our outdoor stage in Byhaven!!! Formed in the summer of 2017, Chaotian is the newest addition to the Extremely Rotten family hailing from Kill-town. The band started their sonic devastation with the well-received demo ‘Where Gods Excarnate’ recorded with the help of Tuna (Phrenelith, Hyperdontia, Sulphurous) that many have placed among the top demos of 2018. With inspirations from bands like Immolation, Demilich, Blood Incantation and Infester, Chaotian exists only to bring riff-heavy, god-crushing death metal of the old vein back to life. Armed with respect for chaotic and doomy death metal, Chaotian does not shy away from experimenting with their sound by combining elements of both extremes with strange dissonant melodies under a two-tongued approach to spewing forth apocalyptic prophecies and hellish imaginations. Currently, the trio is working on new material that will produce a new demo in the first half of 2019 aside from a planned demo compilation through Me Saco Un Ojo. Announcement #24: Ra Al Dee Experience to play “Gloomy Sunday”!!! Today we have the honor of presenting a band that we have asked for years to come and play KTDF and it never happened until now. For all of you who have been sitting at home and listening to the oriental interludes on the Necros Christos albums, we have a treat for you – cause Mors Dalos Ra from Necros Christos will be joining us with percussionist Ben Ya Min Al Dee performing the songs of the mighty RA AL DEE EXPERIENCE as part of the “Gloomy Sunday” warm up!!! 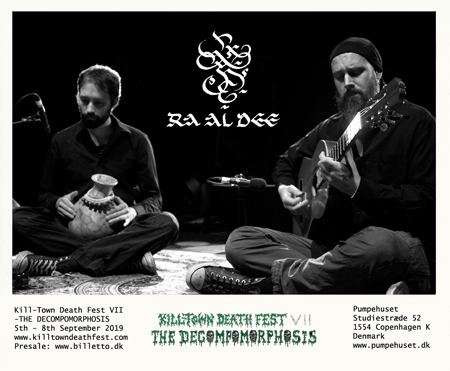 Ra Al Dee Experience is performing acoustic oriental craftsmanship with strong mystical content in own compositions. Its name deriving from its two players: Ben Ya Min Al Dee – Percussion, Voice and M. Dalos Ra – Guitar, Saz, Voice. Founded around 2007 in Berlin, Germany while recording the first demo in 2009, released by Ván Records officially. Heavily inspired by al`Oud players such as Munir Bashir and Rabih Abou-Khalil, the music in itself follows classical Persian and Indian motives with a strong portion of dark extravaganza and even obscure Jazz elements.Titles and themes of the compositions derive from Kabbalah mysticism and the vast secrets emerging by studying Torah. A Mini Album was released by Ván Records in 2016, entitled Diatessaron. Announcement #23: Accoustic warm-up to “Gloomy Sunday” with The Dead Creed (gr)!!! Today and tomorrow we are presenting something we have never tried before. We are branching out and taking things onto the unbeaten path… We have for years been toying with some ideas on how to expand the “Gloomy Sunday” concept and finally this year we have been able to make these ideas materialize. We want to make an opening afternoon on our outdoor stage with two acoustic acts, both fitting in vibe and atmosphere, but also directly connected to death metal. 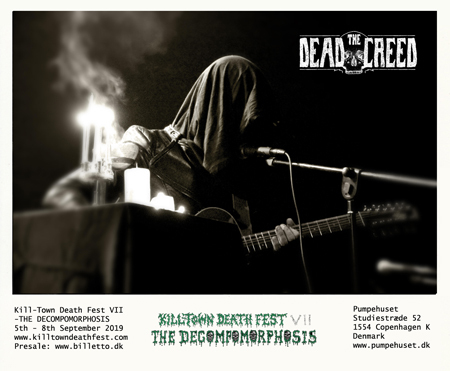 Therefor we would like to present to you the first of our two scheduled acts for the “Gloomy Sunday”warm-up; the great acoustic one-man death metal act; THE DEAD CREED!!! The Dead Creed is a mesmerizing one of a kind music project. It was conceived during fall 2014 in a flooded catacomb under a chapel in the middle of nowhere at the Holy Mountain area of Northern Greece. The aim was to create acoustic Death Metal music that resembles to Orthodox Monastery mass. Catacomb Blues, a demo with the first two songs was recorded inside the cave using a mobile phone, capturing the essence of the Creed together with the monstrous reverb created by the cave and the water in it. It was uploaded for free download on bandcamp. Few months later, album material was recorded in a Professional Studio using cutting edge equipment to recreate the sound of the Catacomb. 22 Shows in Europe plus Japan were organized and performed alongside significant metal and non metal bands leaving a very strong impression to the attendees, musicians, organizers and venue owners due to the massive live sound, compositions and imposing performance. Today, the album of The Dead Creed is in the pressing plant, and actions are being taken to organize another series of appearances. Distinctive sound, Fits no Genre, Can play along different styles of music, breathtaking performance of one person that sounds like a 3-4 piece band without the use of samples or pre-recorded parts. The Creed has proven to be able stand equally next to big bands; on small and big stages. Able to create an atmosphere by opening concerts and festivals, Can perform as an atmospheric interlude between bands, and also as an after headliner. Mystical, capturing, awe inspiring and minimalistic performance; powerful enough to impress the audience of a wide span of musical preferences and put them into a trance. 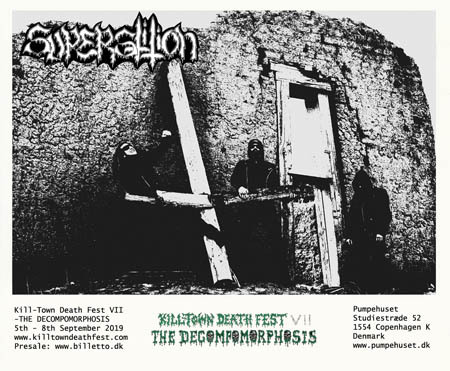 Announcement #21: very first European bombardement for SUPERSTITION (us)!!! Tonight we turn our focus back towards the States, where we have the honour of presenting a very fresh new outfit with only a demo out so far, but a very promising one. They are in our humble opinion one of the most interesting new outfits to rear its ugly head from the thriving American death metal underground. 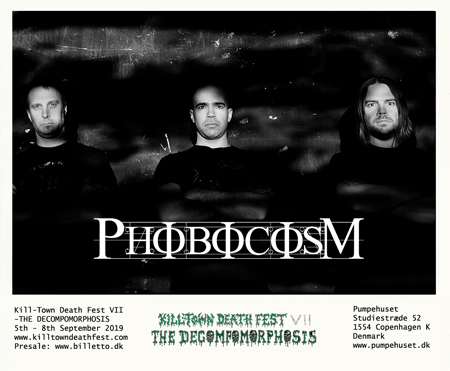 We are therefor very excited to present to you the first bombardent on European soil for SUPERSTITION!!! Superstition was forged in the furnace of death to construct ripping evil in the classic vein of the Americas. Through the smoke of ruin, the four malefactors of the phantom swarm committed the ‘Surging Throng of Evil’s Might’ demo to tape in the dying moments of 2017. 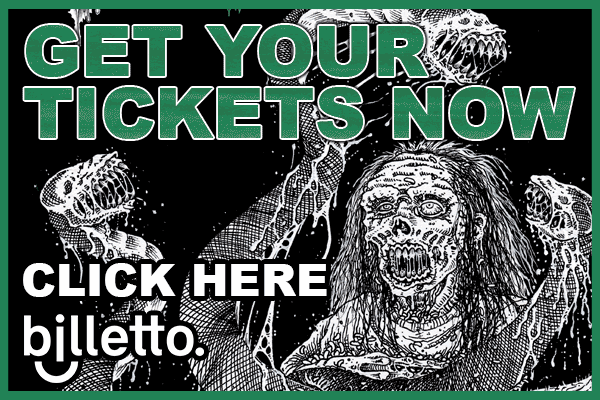 Charging themselves with upholding the menacing lunacy of early American bands such as Necrovore and Possessed, Superstition serves as a torch in the dark to fellow subterranean miscreants standing in opposition to modernity. ‘Surging Throng of Evil’s Might’ showcases ripping, riff-focused evil in the vein of early pan-American progenitors from the U.S., Mexico, Brazil, Columbia, and Peru. Warp speed riffs and searing, chaotic solos played with uninhibited belligerence run headlong into horrific analog manipulation to guide the listener into total spiritual destruction in the outer realms. Quickly after self-releasing their initial offering, the band formed an alliance with 20 Buck Spin for an LP version of the demo as well as future conspiracies. In mid-2019 a new shapeless evil will be unleashed. Wrought in the discordant shadows of the preternatural world, Superstition’s debut full length will bring humanity to waste in the pan-dimensional realms of illimitable darkness. Coinciding with the release will be a global assault upon the underground with performances across the US, Canada, Mexico, and Europe.